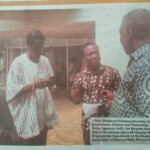 Food Sovereignty Ghana defends position at seminar on GMO’s! Minister of Environment, Science, Technology, and Innovation. Food Sovereignty Ghana (FSG) on Tuesday morning April 10 participated in a seminar organised by the National Bio Safety Authority (NBA) at the Teachers Hall in Accra. The seminar which was under the theme: “Can Genetically Modified Organisms (GMO) contribute to the socio-economic development of Ghana?” drew stakeholders from both sides of the GMO controversy. Members of the panel included scientists, a socio-economist, an agronomist as well as representation from civil society. Speaking in favour of the motion, Dr Marian Quain of the Council for Scientific and Industrial Research (CSIR) was the first to make her presentation. She spoke on the science behind the creation of GMOs and proposed their use to tackle some of the challenges facing the nation. However she was clear that GMOs did not represent the panacea to solve all of Ghana’s agricultural problems. FSG was next to present, citing the lack of scientific consensus on the safety of GMO’s among the scientific community as an early warning sign for Ghana to tread cautiously with regards to policy formulation. FSG stressed that the world was witnessing a phenomenal rise in demand for organic fresh produce and expressed concern at the lack of attention from policy makers to guide Ghana’s agricultural direction towards meeting the needs of these growing and lucrative markets. The fact that the boll worm in the USA is already documented to have developed resistance to GM maize as well as the resistance of the pink boll worm in India to GM cotton all point to a technology which despite its huge financial costs ultimately does not deliver on promises. FSG used the example of the GM cotton experience in Burkina Faso and the fact that the shorter length of fibre which was expressed as a result of the genetic engineering did not suit the needs of the industry and thus reflected the concerns about unknown outcomes of genetic engineering. One member of the audience questioned the competence of the technology if there was an inability for risk assessments in Burkina Faso to highlight some of these unfavourable outcomes achieved.The General Secretary of the General Agricultural Workers Union (GAWU) Mr Edward Karaweh made a solid case on how GMOs would harm agriculture and farmers livelihoods rather than solving problems. He cited the lack of access to land, credit, roads, post-harvest and irrigation technology as the real issues facing agriculture and presented convincing arguments to the audience that GMOs would not tackle these problems. 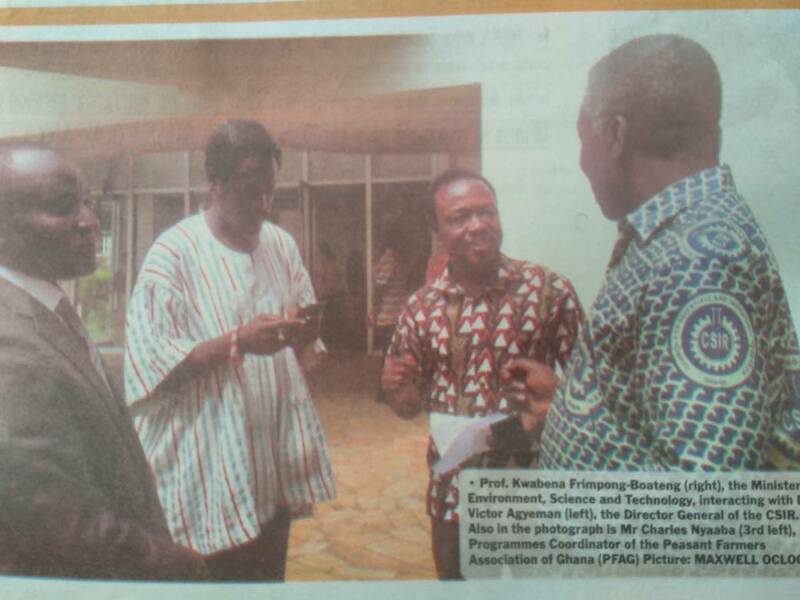 He said “they have lost the battle trying to link GMO to socioeconomic development of Ghana. GMO is not even one, not to talk about being an important solution to our development needs”Dr Gloria Addico, Head of the Technical division at the NBA spoke on the role of the regulator in managing issues on the biotechnological front. There was a very robust question and answer session after all presentations were made where the audience sought further clarity.